Our Fight Card entry this month comes from Nathan Walpow, author of the popular Joe Portugal mystery series (www.walpow.com). Fight Card: Push takes us behind the scenes and behind the hoopla of the world of professional wrestling. You’re a ‘jobber’. You make your living by losing in the wrestling ring. You’re a good wrestler, but promoters don’t think you have what it takes to become a superstar. Then Thumper shows up. Big and strong, with a bunny-rabbit gimmick and fans eating out of his hand. His finishing move is called The Thump, and most guys don’t get up from it on their own. One night, Thumper puts his opponent in the hospital. Not a big deal. Sure, the outcome of a wrestling match is fake. But the ‘bumps’ in the ring can be all too real. Sometimes you get hurt. Part of the territory. Then it happens again. Only this time, the guy who got ‘thumped’ is tossed into a car like a sack of potatoes. Lou Boone, the promoter who runs Central States Wrestling with an iron fist, knows you saw something and offers you a ‘push’ if you keep your mouth shut. A push. Every jobber’s dream. To get to win some matches, to get to be on the big cards in the big arenas. You want it more than anything. You begin thinking you imagined the sack-of-potatoes guy – until it happens again. We have also recently release or second Fight Card charity anthology, Fight Card Presents: Battling Mahoney and Other Stories, which is available via Amazon as an e-book for $2.99 with 100% of the proceeds going to help the family of the late Jory Sherman. A paperback version will follow shortly. 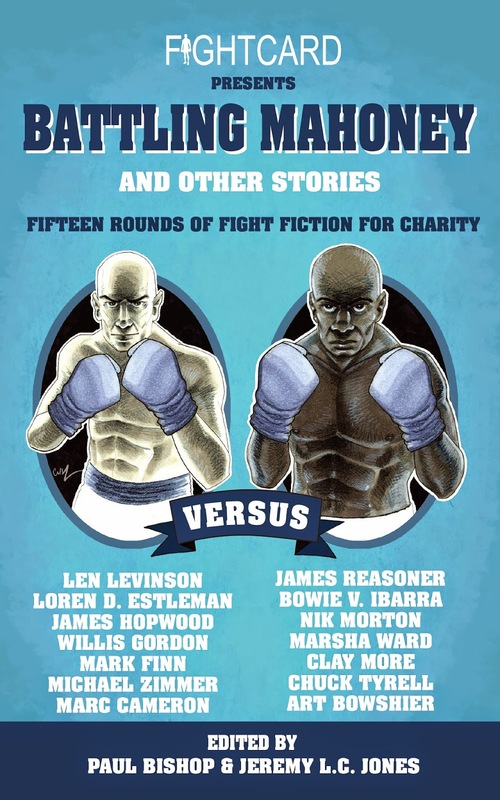 The second in a series of charity anthologies from the Fight Card authors’ cooperative – a writers’ community featuring many of today’s finest fictioneers – features fifteen rounds of fight fiction from authors James Reasoner, Loren D. Estleman, Len Levinson, James Hopwood, Mark Finn, Jeremy L. C. Jones, Michael Zimmer, Marc Cameron, Nik Morton, Marsha Ward, Clay More, Chuck Tyrell, Bowie V. Ibarra, Art Bowshier, and featuring an extensive essay, On Boxing, by Willis Gordon. Fight Card’s upcoming line-up includes Bareknuckle Barbarian from Teel James Glenn (featuring the two-fisted adventures of Bob Howard – R.E.H. ), Job Girl from Jason Chirevas (the sequel to Monster Man), Joseph Grants long awaited The Guns of November, and a new Fight Card Sherlock Holmes tale from Andrew Salmon.